California Gov. Gavin Newsom vowed Tuesday to crack down on cartel-grown black market marijuana despite questions about the scope of influence Mexican drug rings are having on the nation's top cannabis producing state. Newsom said during his State of the State address that he's pulling 360 of the state's National Guard troops from President Donald Trump's border security deployment, which the governor described as part of a "manufactured crisis." The troops will be "redeploying up north to go after all these illegal cannabis farms, many of which are run by the cartels that are devastating our pristine forests and increasingly themselves becoming fire hazards," Newsom said. While many in California's legal pot industry - recreational sales began in 2018 - have been clamoring for enforcement against rogue operators, some experts question any blaming of cartels for much of the state's illicit pot output. "I don't know about this old 'cartels' thing," said Dale Gieringer, state director of the marijuana decriminalization group, California NORML. "Frankly we've seen very little at all about illegal activity in the way of growing in the wilderness the way we used to. Cartel involvement is a bugaboo they like to throw around." William Honsal, sheriff in the cannabis epicenter of Humboldt County, said he has seen evidence of cartel connections to "trespass grows," which are operations set up on state or federal land, the amount of such activity seems to be down recently. "We're seeing a reduced amount of trespass grows on public land in the last few years," he said. "We've had to actually turn away help because we don't see the trespass grows the way we used to." The sheriff said cartels are "pulling out" of the business to focus on methamphetamine and heroin trafficking. On Monday the Humboldt County Sheriff's Office announced its largest one-time seizure of heroin its history -- 12 pounds found during a traffic stop. Emily Brady, author of "Humboldt: Life on America's Marijuana Frontier," told NBC News last year that she viewed law enforcement's claims of major drug cartel involvement in Northern California cannabis cultivation as tall tales based on the mere presence of Mexican farm workers. "I've never seen or heard of any cartels growing weed," she said. 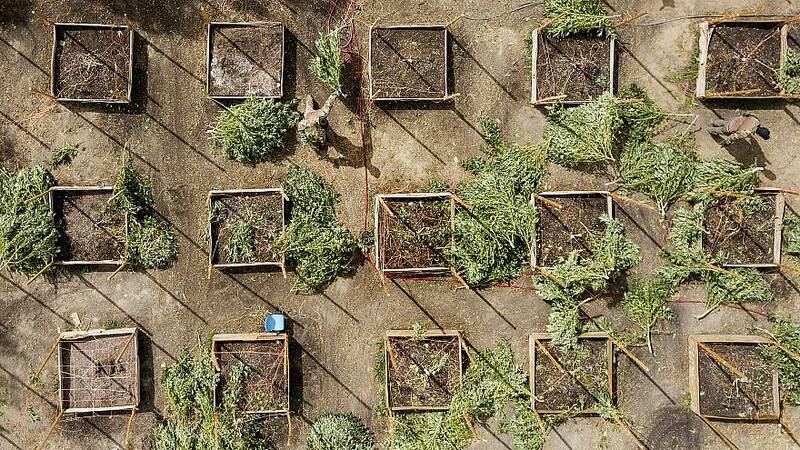 California has long been the country's leading producer of marijuana, and experts say a vast majority of the state's output is illegally grown -- and that much of it is transported across state lines. Newsom was one of the early political architects of 2016's Proposition 64, which legalized pot sales to the 21-and-older set while instituting strict licensing for businesses. One of its promises was to level the playing field for entrepreneurs who wanted in on the legal market. 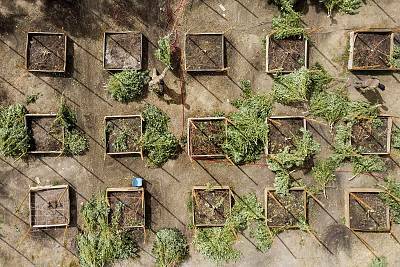 Terra Carver, executive director of the Humboldt County Growers Alliance, said illicit farms have been operating with an unfair advantage in the region for too long. "We applaud his leadership in really going after after trespass grows," she said of Newsom. Legalization advocate Dale Sky Jones, executive chancellor of Oaksterdam University, said targeting illegal cultivators was "a great place to start." "Anyone on national or state land is illegal, full stop," she said. "We have no problem with Newsom addressing this issue," Marijuana Policy Project spokesman Mason Tvert added. "We're just not sure the National Guard is the right tool." "I appreciate the governor and where he's going with this," he said. "We do need more resources. We will use what we get."